Abu Dhabi -- Nexter, the leading French land defense company and part of KNDS Group, has been a longstanding partner supporting the modernization of the TNI (Tentara Nasional Indonesia) since entering into an initial contract in 2012 to supply 36 CAESAR® artillery systems. Today at the IDEX 2017 trade show, Nexter is proud to announce the signing of a new contract to supply a further 18 CAESAR® systems to the Indonesian National Armed Forces. 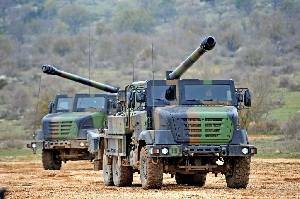 The CAESAR® 155mm wheeled self-propelled howitzer, deployed by the French Forces during operations in Mali, as well as in Lebanon, Afghanistan and Iraq, is recognized worldwide as striking the best balance between the simplicity of towed artillery and the mobility of a self-propelled system. Not only is the CAESAR® highly accurate and mobile, allowing it to evade counter-battery fire, it also has the lowest maintenance costs of any mobile artillery system on the market. It is in service with the armed forces of France, Indonesia, Thailand and a Middle Eastern country, and over 270 CAESAR® systems have already been produced. They have fired more than 80,000 rounds and covered a distance of over one million kilometers. In addition to the artillery systems, Nexter will also provide its firing control system, FINDART®, CAESAR® simulators for training and over 50 artillery battalion auxiliary vehicles assembled in Indonesia by its local partner PT Pindad. “This latest success in Indonesia demonstrates that the impressive performances of CAESAR® meet the most demanding requirements on the ground in South-East Asia” commented Gilles Sarreau, Senior Vice President Artillery, Turret and Weapon System Programs.